2012 BMW X1 review | What Car? The BMW X1 has just been given a mid-life update to help it compete with newer rivals such as Audis classy Q3 and the super-efficient Mazda CX-5. On the outside, some of the plastic body cladding has been ditched in favour of more upmarket body-coloured panels, plus you get new LED headlights, new alloy wheels and a more prominent rear underguard. The changes continue in the cabin, where some of the materials have been upgraded and theres a more driver-focused centre console design. However, the most significant work has been done under the bonnet; every X1 except the recently introduced Efficient Dynamics edition gets engine tweaks that help reduce fuel consumption and emissions. In addition, all X1s now come with a new Eco Pro mode that adjusts the throttle responses and the behaviour of the climate control and automatic gearbox (where fitted) to help maximise efficiency. Whats the 2012 BMW X1 like to drive? We drove the new xDrive25d model, which sits at the top of the X1 range and replaces the 23d. Like its predecessor, the 25d uses BMWs twin-turbo 2.0-litre diesel engine, but power has risen from 201bhp to 215bhp, while average fuel economy is up from 47.1mpg to 47.9mpg and CO2 emissions down from 158g/km to 154g/km enough to drop the new model one company car tax band. The engine is deceptively strong because it builds speed extremely progressively; the turbos work sequentially, plus the smaller of the two features variable geometry to further improve flexibility. Our car was also helped by the fact it was fitted with the optional eight-speed automatic gearbox, which shifts smoothly and intelligently. The auto now gets stop-start technology as standard (previously this was available only with the standard six-speed manual), so its even more efficient than the manual car, averaging 51.4mpg and emitting just 145g/km of CO2. The composure shown by the X1 on twisty roads is equally impressive. Unfortunately, the inconsistently weighted steering undermines your confidence in the car and makes it feel a little nervous on the motorway. The X1 is pretty good at shutting out wind- and road noise and the 25d engine is smooth. However, you have to put up with an unsettled ride. Unlike, the other models in the line-up, the 25d is available with four-wheel drive only to help transfer its considerable power to the road cleanly. 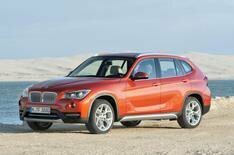 Whats the 2012 BMW X1 like inside? The dashboard is logically laid out and it features smarter looking materials than before, although theyre still not as classy as the ones you find in the Audi Q3 or other BMW models. The driving position is harder to fault and all-round visibility is good (at least it is in auto cars). However, the X1 is really only a four-seater because the wide transmission tunnel makes life very uncomfortable if you have three across the rear bench. Still, the boot is a decent size and the rear seats fold down flat. Every X1 comes with dual-zone climate control, aux-in and USB sockets, Bluetooth connectivity, rear parking sensors and electric windows, front and rear. M Sport models bring sportier styling and handling, plus theres a new Sport trim for those who want a sporty look thats a little less aggressive, and an xLine trim, which gives the X1 a more rugged appearance. The revised X1 is a slightly classier car than its predecessor, and it now has an even bigger advantage over its main rival, the Audi Q3, when it comes to efficiency. However, its let down by inconsistent steering and an unsettled ride. If you can afford the higher running costs, the Q3 is a better car.